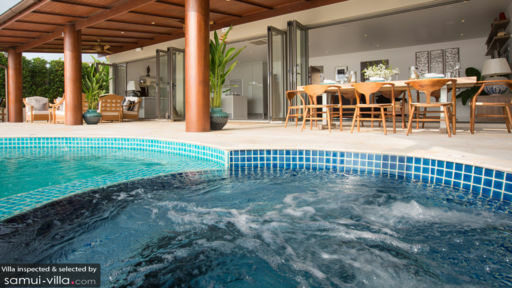 Villa Nagisa is a tropical paradise with the most ideal location on Bangrak Beach close to Chaweng. The four-bedroom private retreat is dream come true with the sea in the distance and beachside location. The stunning interiors speak volumes of the contemporary aesthetics of the villa, and the private spaces ensure a wonderful and memorable time in Samui. Outdoor and indoor sitting is a plenty at the villa, so that you get the best of both worlds. Catch the early sunrise or sunset from the pool or even your bedroom, as you relax amidst tranquil surroundings. There are four, splendid and air-conditioned bedrooms at Villa Nagisa with excellent views of the sea that can be viewed directly from the bed. Three of the bedrooms are fitted with king-sized beds and the last bedroom has single beds. Each bedroom leads outdoors to a private terrace with armchairs and a gorgeous view where you can enjoy your morning tea while you relish the calm and meditative nature. All four bedrooms have spectacular en-suite bathrooms with white interiors, freestanding square lagoon-bathtubs, dual basins, and large windows for ample lighting. Mesmerizing views greet you outdoors as you reach the pool area at Villa Nagisa. 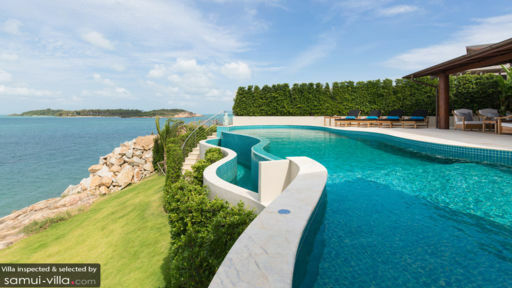 A freeform, infinity-edge swimming pool sits at the edge meeting the sea in the distance. A perfect spot for sunset-viewing, the beautiful panorama awaits your arrival. There are sun loungers on the pool deck, ideal for sunbathing, or drinking a glass of freshly-brewed cocktails that can be got from the corner bar. Guests of the villa have the luxury of heading down to the grassy patch that sits right next to the beach. Comfy beanbags are put on the ground with exotic lights, perfect for a tranquil and soothing time spent with loved ones especially when the sun goes down. The porch is furnished with a sofa and armchairs, as well as alfresco dining for a complete tropical experience. 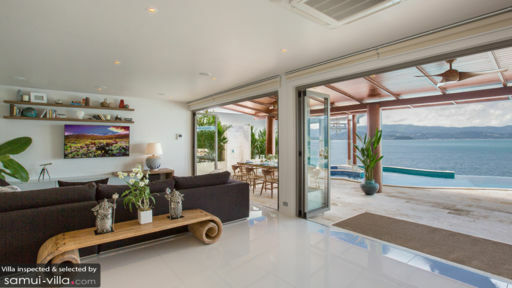 As you step inside through glass doors, you will be welcomed by the pristine white living area at Villa Nagisa. Awash with natural light and the fresh breeze, the elegant living room is furnished with all-white walls and dark-tone furniture to compliment the light. The walls are decorated with classy artwork, the marble floors are dressed in artistic rugs and carpets, and the ceiling is fitted with spot lights for a luxurious and opulent ambiance. A large, flat-screen TV is facing the sitting area for your enjoyment along with a collection of movies. The dining area is right behind the sitting area and is found with a four-seater dining table and Thai artefacts. There are several potted plants indoors for a fresh and rejuvenating fragrance in the room. The open-kitchen is fitted with modern appliances and is fully-equipped to serve you. The staff at Villa Nagisa will look after all the management, housekeeping and maintenance at the villa. Since the villa is child-friendly, the staff can arrange for baby-cot and babysitter, if required. A daily breakfast is complimentary for guests, and the house chef can even prepare lunch and dinner, at extra cost. From the villa, you can catch sight of the famous Ang Thong Marine National Park. Samrong Bay is close to the villa and you can play on the beach with kids for a fun-packed day excursion. Several beachside restaurants offer delicious food, both local and international. Another peaceful beach is the Thong Son Bay beach, ideal for a laidback time.